Barasch has made a frame for the November-election madness, a book of poems to haunt history. 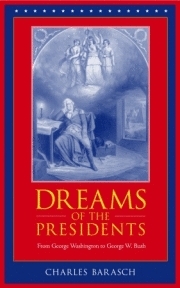 For each president, a dream is conjured, soaked with biographical and historical details. A primitive ancestor to this book is William C. Bullitt and Sigmund Freud’s dour psychoanalytic portrait of Woodrow Wilson. Freud detested Wilson, and America as the land of Coca-Cola and Hollywood. Barasch’s take is richer: Think Calvino working a poetic exercise in history. The dreams drift lazily over the harder prose of the footnotes, forming a world saturated with sexual imagery and guilt about slavery and imperialism. Melancholic presidents wander the White House hallways, grieving over dead children and spouses. Lillian Gish and Marilyn Monroe, who were half ghosts already, rub against some dreams’ surfaces. The poems are smoke curling around the presidents, something like the fantasy air around the ad men on TV drama Mad Men, which could’ve easily been Barasch’s title.